A group of evergreen coniferous trees from the Pinaceae family. 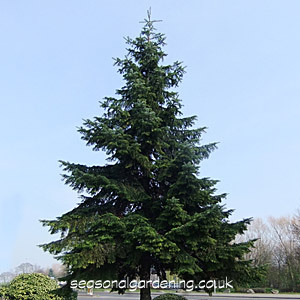 Abies range in size from very large trees too slow growing compact plants ideal for a small garden. Most species produce cones that range in size, shape and colour, depending on variety. Foliage: Needle-like grey or green leaves, with a lighter underside. Evergreen. Often fragrant. Cones: Large brown, blue or purple pine cones. Soil: Moist but well-drained, slightly acidic soil (clay, sand or loam). Acid or neutral pH. Conditions: Full sun, any aspect, in a sheltered location. Hardiness: Fully hardy in the UK (down to -20°)C). Plant out pot grown specimens in the spring. Fir trees will grow in most soil types apart from alkaline soils. Feed lightly with a balanced fertilizer during the growing season. Keep the roots of young trees moist until well established. Unless you're growing a hedge, leave the leading shoot and only prune side shoots to keep a compact and neat conical/triangular shape. Susceptible to infestation by aphids and adelgids. Can be affected by honey fungus. Sow seed in autumn. Prick out seedlings when large enough. Plant out in spring, once they exceed 1ft (30cm) in height. A. koreana (Korean fir) a hardy and compact pine that bears purple cones. Height 15ft to 40ft (4.5m - 12m). A. balsamea (balsam fir) a narrow conical form that gives off a strong smell of balsam. A. concolor (white fir) has smooth grey bark and blue green foliage. Height 80ft to 195ft (25–60m). A. homolepis (Nikko fir) a medium height fir with pale green leaves. The young cones are purple. Interesting flaking bark that reveals a red underbark. Height 90ft to 120ft (30–40m). Good resistance to air pollution.